These young birds that are beginning the process of leaving the nest and learning to fly. They do this under the watchful eye of mum and dad. If they are on the ground, it is often because of that reason so please do not “rescue” them unless they are injured or in danger. Their parents teach them the lessons and survival skills they need, such as how to fly, what food to eat, how to find food and how to avoid predators. Ground dwelling birds such as ducklings and plovers can be moved to safety but avoid moving them too far from where they were found. They will start calling for their parents so it is important to keep them local. Once their parents feel the danger (you) has left, they will come back and continue to take care of their off spring. Tree dwelling birds are often found on the ground because they are learning to fly and haven’t quite got it right yet. If you find one of these, follow the instructions below on how to build them a temporary nest. Birds don’t reject their young after they’ve been handled by people. If the baby bird is sick, injured, or has been in a dog or cat’s mouth – please keep it warm and transport to your veterinarian (or Animal Emergency Service after-hours). It is best to contain the bird in a box or bucket with a towel covering the opening. Avoid a lot of noise when transporting as the journey will be stressful. Make note of the exact location you found the little one as it is vital they are returned as quickly as possible to that same location. 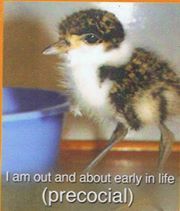 If it isn’t safe for you to handle the bird, contact WildCare Australia on 07 5527 2444, or the RSPCA 1300 ANIMAL (264 625). Under the Queensland Nature Conservation Act 1992 it is against the law to take Australian wildlife from their habitat. 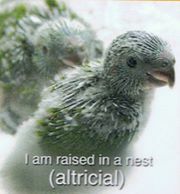 If the bird is really young and has soft and fluffy down instead of feathers and you are not able to place it in it’s original nest, then you need to make a new home using a bucket, (approx 40 – 50cm deep) with holes in the bottom for drainage. Put in a layer of soft leaves or grass. Place a stick (about 60cm long) in the bucket and secure it into one of the drainage holes so the parents and baby bird can get in and out. Hang bucket head height in a leafy protected area away from direct sunlight and as close as possible to where you found it. Mum and Dad do not mind if the baby bird is in a different tree or has been handled by a human.